I mentioned this book in my last post–I goofed on the title because I was trying to recall it from memory. It is called “1000 Things Worth Knowing” and was written by Nathaniel C. Fowler, Jr. and was published in 1913. If you click on the link you actually can read the entire book online! You know, if like me you are up at 1 am and have nothing better to do! This book belonged to Aaron’s grandfather and he has his name and the year 1927 written inside. As you can imagine, there are some funny little tidbits of wisdom to be found. Of course the human races knowledge has grown SO MUCH over the last 100 year but it is interesting how much of what in this book is true even today. I thought I’d share some of the things that Mr. Fowler though was worth knowing back in 1913! My comments follow in red. Apparent Death–Never assume that a person is dead because he appears to be. Summon a physician. A fairly good test of death is to hold the hand of the person apparently dead before a candle or other light, with the fingers stretched out, each touching each other. Gaze intently between the fingers, and if the person is alive, a red or pink color will undoubtedly be seen where the fingers touch each other. I’m guessing this is before they discovered what a pulse was?! Cleanliness–It is said that cleanliness is next to godliness. The fact that thousands of persons enjoy good health without even taking an infrequent bath must not be used as an argument against regular bathing. These persons, if in health, live out of doors and Nature seems to take care of them; but it is obvious that they would be healthier and stronger is they gave proper attention to bodily cleanliness. The practice of a partial bath is not to be recommended. When you take a bath, take it all over. Just say NO to bird baths! Exercise: Walking is the best of all for it can be enjoyed by those in poor health or physically weak. Everyone should walk at least 2 miles a day in the open air, unless he is weak. Still great advice! I had a 96 year old patient recently who walked 2 miles every single day either outside or on her treadmill. It may take her an hour (or more) to do it, but she would do it! Headaches–Under no circumstances take a headache powder, or any drug whatsoever, without the advice of your physician. Can you imagine calling your doctor now and complaining of a headache?! Vomiting–Lie down and hold small pieces of ice in your mouth. If it continues, consult a physician. Brain–As the action of the brain has not as yet been seen by man no one at the present day knows just what it is. It would appear that the size of the brain unless it is unusually small, has little to do with its quality. Soap–Many of the soaps upon the market are impure and even dangerous and never should be used. I’m thinking that I have to agree with him still on this one–soaps contain some pretty harmful stuff even now. Snake Bite–The wound should be washed with sodium solution and large doses of whisky or brandy should be administered. Bring on the whisky! This seems to be a common trend throughout this book! So here is my short list of various things that are worth knowing. Some funny, some serious–well as serious as I can get at 1 am! Tracheostomies–When cleaning a patient’s tracheostomy be sure that the home is free of flies, mosquitoes and other flying creatures. If a fly is accidentally inhaled, do not freak out but call the physician right away and then prompt the patient to suction themselves frequently until all fly particles are removed. Yes, this is a true story. The fly came back out the next day–completely intact I might add–and the patient was fine. I will never forget that as long as I live. My co-workers gave me some fly tape at our next staff meeting as a joke. Ha ha ha. Very funny! Potty Training–Do not be embarrassed to use any means necessary when training your child to use the toilet. It’s okay to tell them that the potty wants to eat their poop. Really, it is and it works. Your child will think you are the smartest person in the world from ages 0-6. Then they will start learning stuff in school that you don’t know about and then they start to realize that you aren’t as smart as they thought. Uh-oh. There is a swirling vortex of trash floating in the Pacific Ocean that is nearly twice as large as the continental US. It’s called the Great Pacific Garbage Patch. Now go and impress your friends with that knowledge. Oh–and REDUCE, REUSE and RECYCLE!!! I hope to have some time tomorrow to take a few more photos of the completed room. Before it was a blue color and I hated it. Now I absolutely love it! For now, here is a little peek into our bedroom. When you come up our stairs and open the (newly installed) door it opens right into our bedroom. This picture was taken from right inside the doorway–you can see the relection of the door in the mirror. If you turn to the right you will be in the bedroom and to the left is the bathroom door. So essentially the entire upstairs is a master bedroom/bathroom/suite! Lamp was one that I bought at Family Dollar several years ago. Chair was an antique store find in Greenville, NC–I think I paid about $6 for it about 5 years or so ago. Brown pillow was a 90% clearance item from Pier One–I think I paid a couple of dollars for it! That was 2 years ago. Red Indian treasure box on the table was also from the Pier One sale. I think I paid about $5 for it! I love it! Plant was a recent Target 30% off find–it was about $6. Mirror was one I found in the dormer–I have had it since I was a kid. Was planning on painting it black and hanging it in the bathroom but I decided that I like the gold color and it fits in well here! Books on the table both belonged to Aaron’s grandparents. The red book is called “1000 things you should know.” It is pretty fascinating as it is almost 100 years old! Some of the stuff is so funny–particularly the medical stuff. I may just have to get it and put some of it on here! Under that is Aaron’s grandma’s bible–well worn and loved by her for many many years! Rug was another Target 30% off find–it was $21 and when I saw it I just had to have it! I can’t wait to use it in our next home. I love, love, love the print on it! So most of the stuff I already had. Bought the rug and plant so in total I spent $27 on this little area. Tomorrow I’ll post photos of the rest of the room including the new curtains–LOVE them! We are definitely using this paint color in our next home. It matches the curtains so well. Aaron is going to finish painting the closet doors tomorrow so I should be all set to take photos after that! Really? What are the things that you place value on? Your house? Your car? Your career? Your clothes? What are the things that you think that you just couldn’t live without? Honestly stop and ask yourself that question. Is your treasure with earthly things? I have struggled the last year with allowing God to break me from the deceit and ungodliness of materialism and consumerism. Sometimes I start to get sucked back into it and when that happens God smacks me on the forehead and tells me to wake up! Over the last few months Aaron and I have discussed and decided on a price range for our new home. It was a modest little number that was way less than what our current home now costs. We decided that if our new home is smaller that we would be okay with that. Then I started thinking, “Well ya know–if we go up just another $10,000 then we could have a much nicer, bigger home.” If I work an extra day a week then we could really have a nicer home. If this . . . if that . . . Who am I trying to impress? Why do I feel the need to meet everyone else’s standards? Last night I was reading Heather Whittaker’s blog last night and came across this video that she had posted. I cautiously clicked play. She warned her readers that it would challenge them, that it would move them. So I clicked on it. Thanks God for the smack in the forehead. Please watch this. It will break your heart. But you will be moved and hopefully for the better. I cried and cried watching this. Aaron and I watched it together and he said, “And to think that we are worried about what house we are going to buy.” Did you catch what the cameraman/narrator said? He mentioned that most organized religions are more concerned with devoting time and energy into defending dogma than they are with the needs of the world. There are people starving in this world. Let that sink in. STARVING. Starving for food and starving for hope. And we sit here in our Americas churches and we argue about petty things that have no significance for eternity. What is wrong with us? It’s so easy to shield our eyes from this and forget about it. Lord, please keep my eyes open. Help me to remember what is important. Help me to remember that you are not impressed by our ability to ‘defend dogma’ or our ability to raise money and build huge buildings and temples. You are not impressed by our big houses, our cars, our fancy clothes or our careers. You want us to love others like you love us. Unconditionally. Regardless of race, of social status, of cleanliness. You frown on materialism and consumerism and you smile when we give of ourselves to help others. When we stretch ourselves beyond our means to show love and to show YOU to others. Forgive me for selfishness. For coveting. For not making YOU first and for making things and stuff first. May we all remember that in 60 years, 70 years, 100 years none of this is going to matter. Our houses will be lived in by someone else. Our cars will long have been dumped at the junk pile. The things that we cherish so much will no longer exist. And all that will matter is what we did with our time on earth. Is that cliche? Sure. But it is truth. Make your life matter. Make your life about serving others and it will matter in eternity. As we continue on our homeschool research journey I have come across many ideas that I will want to use IF or WHEN this becomes a reality for us. I love to organize. I love finding jars and baskets and other cool things to store stuff in. I love my Dymo Labeler–it is one of my best friends. So I thought I’d post some of the cool things that I have found on the web. Even if we don’t homeschool I may use some of these ideas anyway to organize our ever growing art supplies, my scrapbook stuff and our books! Check out katiescrapbooklady’s Homeschool/Scrapbook/Sewing Studio! LOVE it! She has some neat ideas! I LOVE the map idea–I’d love to do something similar and mark all the places that we visit. I’d love to do it with a North Carolina map! And I like this idea if our next house is short on space. It’s a clever use of a bookcase! Here is SchoolontheHill’s library! It’s amazing! I already have been dreaming about organizing all of our books and making a library of our own once we move. We have so many books it is insane! I would love to organize ALL the family’s books including mine and Aaron’s and actually use the Dewey Decimel System to do this! It would be quite an undertaking considering that Aaron alone has several hundred books! And you just have to LOVE the yummy colors in Nicandboy’s Homeschool Room! She also has a neat way to display her books for easy access! I have already decided that chalkboard paint will be used some place in our new home! I used it on one of the girls’ tables and they loved it! I’m thinking a whole wall needs to be chalkboard painted! And if you use metallic primer like suziebeezie did, it makes it magnetic! Sweet! And just for fun, ya gotta love this VW beetle all “chalked out”. I think the organizing part of homeschooling gets me just as excited as the actual homeschooling part of it! Annagrace asked me tonight again if we are going to homeschool next year. I am about 98% sure that we are but not quite to the point where I will say it definitely. Although I just read THIS in the Greenville paper and it made me think that we were on the right track with homeschooling. Sounds like at least some of the public schools down there are in shambles. Anyway, Annagrace was very upset tonight and came in the living room crying because she doesn’t get to see me very much. Made me very sad!!! I hate working full time! I NEED to be here with my children. I do not want them to grow up and only remember that Mom worked all the time. One of the perks of us moving will be decreasing my working hours from 36-40 to about 24 with a goal to increase my photography business so that I can work even less nursing hours a week! Oh, a girl can dream! And one last thing. I asked Aaron the other day if he thought that I was smart enough to homeschool the kids. He hesitated and I though, uh-oh. Then he said, “Yeah–you can do it.” Then we found my 9th grade report card (can you believe that I still have it?!) and I think it put some doubt in my mind. Oh, oh, woah, oh…..I’m still alive. That’s my ode to Pearl Jam–one of THE best rock bands EVER! Anyway—-Yes, we’re still alive! I have had no time to blog lately! This week we painted the master bedroom, got the new curtains hung, and replaced the blinds. My mom and dad are up this weekend so dad hung a new light fixture for me. We are so, so, so close to having this house ready! Gonna finish up a few little things here and there tomorrow and Wednesday will be our deep cleaning day. Then a week from Monday . . . our house will be for sale!!! Hope to get back to blogging regularly soon! Thanks for stopping by and checking in! I’ve done my share to stimulate the economy today! Annagrace has been a little down in the dumps lately about not getting to spend much time with me. Between working and getting the house ready and trips to NC and the holidays it’s just been too crazy to do much together. So today we went out to the mall to eat some lunch (Sbarro–yum!) and to do some shopping. Annagrace normally hates shopping. Imagine that–a girl who doesn’t like to shop! But today she was good and didn’t complain and got several things for herself . And man did we ever find some DEALS! And she got this adorable sweater dress for the Fall for only $5.97! 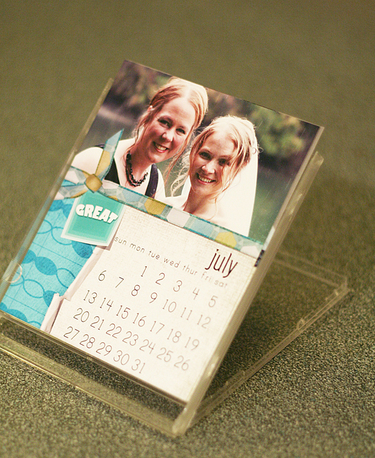 Regularly priced at $35! I also got a bracelet that was regularly $18 and was marked down to $4.18! Then we were off to Bath and Body Works where we found a really great deal on shower gel and lotion. Shower gel was $3 a bottle and lotion was $5! I will keep a couple bottles and give the others away as gifts! But there were even MORE deals to be had so we went off to Claire’s where we ran into my friend Heather where we, as Heather put it, “hit the motherload”! I didn’t even realize that everything on this one table was 10 items for $10! She had found these adorable little pocketbooks that were a buck each and the clerk went in the back to get a few more out for us. I bought several things for Annagrace’s birthday party. These bags have some lipgloss included and will be perfect for goody bags for her friends (the bottles of glittery shower gel will go inside). The High School Musical stationary set is for a friend’s birthday that is coming up and the canvas bag, well you already know that’s for me! That includes a sweatshirt, a long sleeve shirt, a short sleeve shirt, a pair of jeans and 2 pairs of yoga pants for Annagrace; a sweatshirt, a turtleneck, 2 pairs of pajamas and a winter hat for Madalyn; and a “swing” 3/4 sleeve coat for me (regularly $70 and I got it for $12!). I feel so happy that we found such great deals! Many of the things that I bought are for next Fall and Winter and it was nice to buy some new things for the girls for a change. I can not remember the last time that I bought them new clothes (they are getting used to getting things from the thrift store or as hand me downs!). Annagrace and I both had fun looking for bargains. It was a great day! My grand total will all the sale prices and including tax was …… drumroll please ……: $102.04! Of course you know I noticed it right away because it said “Simplify” on the cover! I picked it up and was immediately drawn in. 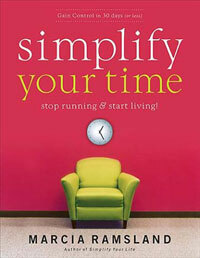 The book is about organizing your life and using your time wisely so that you have more time to actually LIVE. Each chapter offers a new idea that you are suppose to try for 21 days or repetitions. It takes repeating something 21 times for it to become a habit. So far I have picked up some very useful information! Information–kids school calendars, soccer team rosters, etc. So simple right? Then why do I make it so hard. I wait until there are stacks and stacks of papers lying around then I spend hours trying to sort through them. We all suffer because of this. I lost (and then found today!) a check that Aaron needed to cash. I have forgotten to send lunch money to school with Annagrace for several days at a time (it’s okay–they still feed them if they don’t have money on their account! ), I have forgotten birthday parties, I have misplaced bills. The list goes on and on. I have tried so many times to get organized in this area of my life but until I read this I couldn’t find a way to do it that made sense to me and that I would be able to keep up with. Today I worked in the office all day straightening, decluttering, filing and organizing! I started my files using several of her filing recommendations. I put the bills all together and made a bill paying station in the office armoire. I also started a family calendar so that we can all keep up with what each of us is doing. Before Aaron would use on calendar, I would use my planner, then we would refer to the school calendar for Annagrace and Madalyn. So now everything is in one book together. I went through and marked all the teacher work days in it in pink for AG. Aaron’s activities are in red, mine are in black and Madalyn’s are in blue. I am excited about using my file system. Marsha recommends using manila folders in her book. I am using regular hanging files because we happen to have an area for that in our armoire. It looks so nice and neat now! Here is the armoire. I even have a nice place for my work laptop to go and my work bookbag (I have to carry my laptop, BP cuff, stethescope, and notebook among other things in that bag–I love that I can put it in here out of the way!). Excuse the little bit of clutter that still remains. Gonna put that stuff away tomorrow! Can you tell we like Korn?! I have pretty eclectic taste. You will find everything from Pearl Jam to Prince to New Kids on the Block to Fiona Apple in there! My other one holds Christian, Praise and Worship, Country, Rap, R&B, Comedy and everything else in it. I had to make tabs for it so it would be a little easier to locate things. I can’t believe how GOOD that felt to get rid of those CD cases. It wasn’t the cases I was attached to but the actual CDs. I only found 2 in the whole bunch that I wanted to get rid of. I have so many memories tied to music that I have a hard time parting with any of them! And because I am all about reducing, reusing and recycling I am going to donate the old cases to Madalyn’s preschool. I asked one of her teachers and she said they definitely can use them for projects. They usually send some type of CD home each year with photos or songs on it so I am sure they can use them. I did throw out a few that were broken but most of them were in good shape so they will be getting over 200 CD cases from us next week! If you get rid of your cases and don’t have a school to donate them to you can also try your local library (so they can replace broken ones) or you can make a nifty calendar with it. My mom made me one last year and hand stamped something different on each month’s card. It was adorable! I feel like I accomplished a lot today! It feels so good to declutter and to organize. How much time do I waste looking for things (CDs being one of them!). With a few steps in place and the habit of putting things away when I am done I know I will save so much time! What type of organizational things do you do around your house?